The Husband is sick as a dog, poor sweetie. He’s the complete opposite of me when ill- leave him alone, bring the occasional tea or hot toddy and he is fine. Me? I want sympathetic noises several times an hour, offers to fetch the remote, tissues, phone, iPad, etc… And soup. I want nice, preferably home-made soup. Navy Bean Soup is on the menu tonight for two reasons: it is The Husband’s favorite (poor sick sweetie! ), and I want to do a “New Menu Monday” post. So, instead of our favorite bean soup side, The Most Fantastic Corn Bread On The Face Of The Earth, I found an interesting and good looking garlic bread. I was late today, digging this recipe out of my Pinterest board “Breads, Muffins, Pastries and Quick Breads.” well after 4:00 this afternoon with errands still to run. 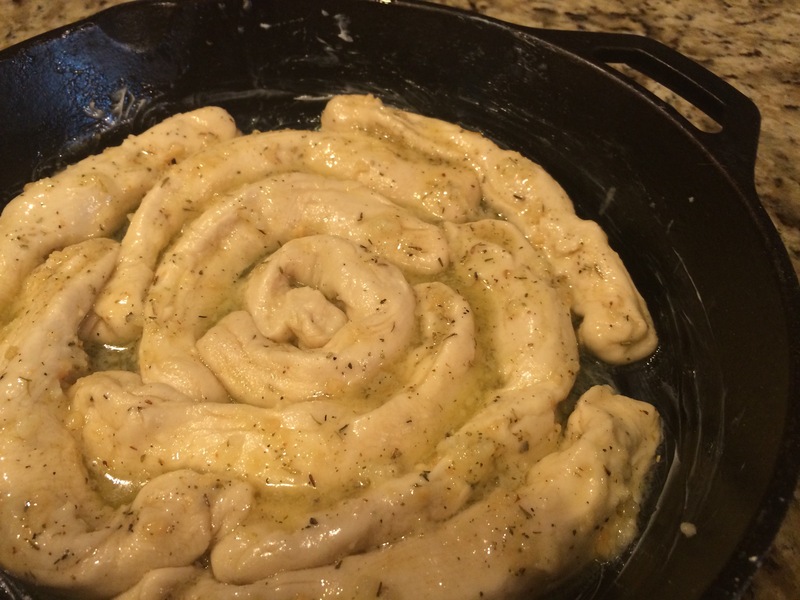 On the way home, I ran into the grocery store and picked up a bag of frozen dough for rolls, as suggested by the author. 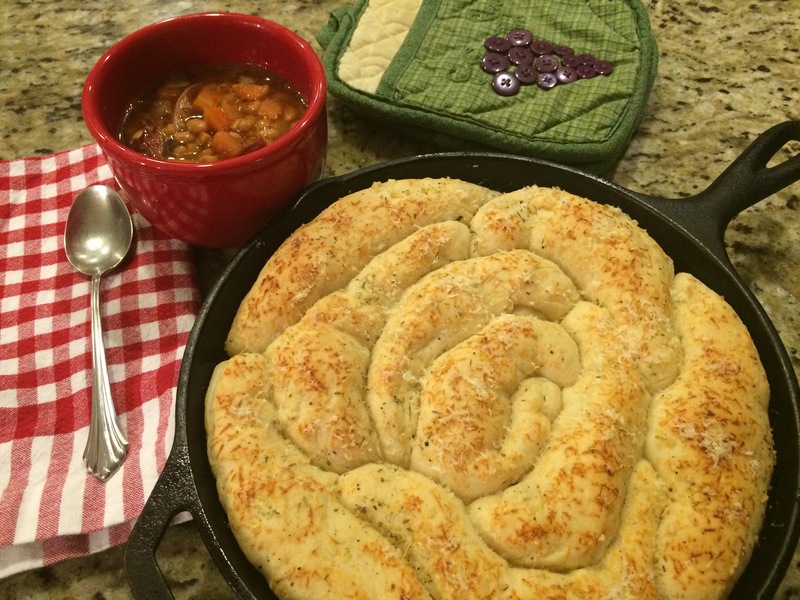 The recipe I’m trying tonight comes from a March 2015 entry from the blog “YourHomeBasedMom.com.” There are tons of great recipes there, go check her out. 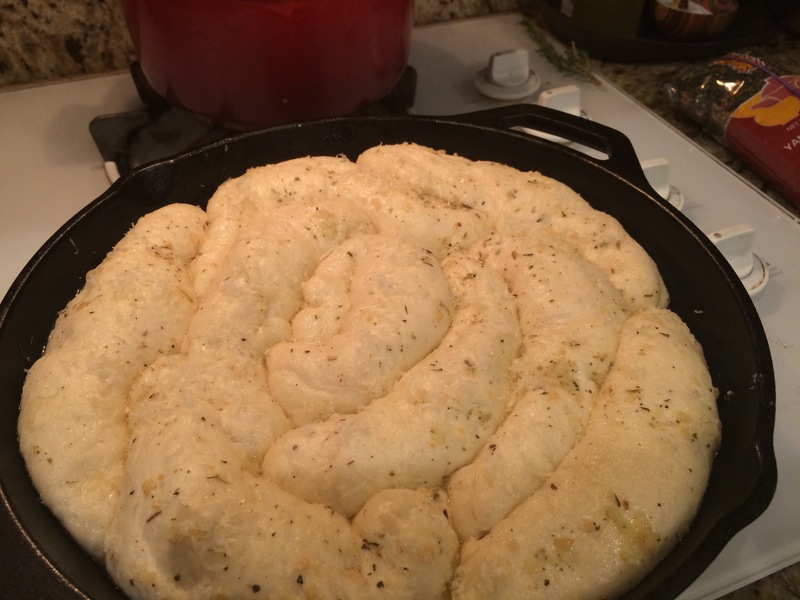 The changes I made to this recipe were to use nine, not 14 rolls; Italian seasonings instead of oregano; fresh garlic, not garlic salt; and real parmesan cheese, not “the kind from the green can.” Her recipe suggests using home made dough, frozen ready-made if you are short on time… which I was. Microwave butter on a plate then mix in the cheese, garlic, and Italian seasonings. 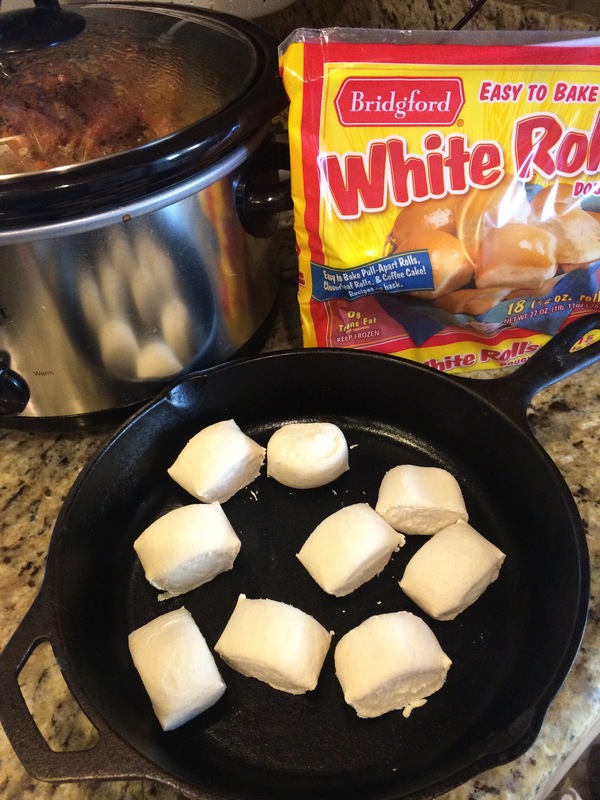 Roll thawed dough balls into ropes, then roll in seasoned butter and place coiled up in your buttered cast iron pan. Bake at 350 for 15-20 minutes or until golden brown on top. This. Was. DELICIOUS! I really think that the fresh garlic really made this recipe. Fast, easy and yummy. 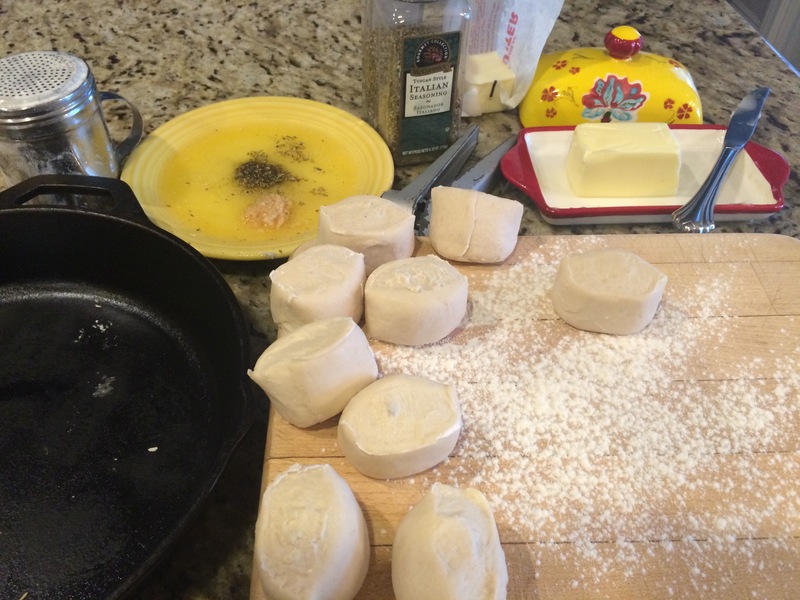 I’m already thinking about how the next time I will make a dough with half whole wheat and add even more garlic and parmesan.